The charité in berlin-mitte has many buildings, some of which have a long tradition in medical sciences. they have been the working places af famous physicians and scientist and the very places to read lectures to pass the precious knowledge to future generations of physicians and scientists. after selecting the ruined auditorium of the pathology for the KAWA/FLUSS project in 1997, angelik riemer decided for the robert koch auditiorium to bring the CRISS CROSS / KREUZUNGEN project to the public. the institute of hygiene of humboldt university (today institute of microbiology and hygiene) was founded in 1885. it was formerly located at klosterstrasse. its first director was, until 1891, the famous robert koch. 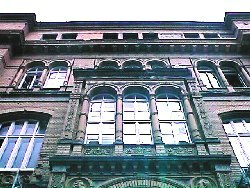 his successor, prof. max rubner, was offered the chair for physiology, so in 1909 max rubner moved with the institute of physiology into new buildings at nassauische strasse, which actually had been errected for the institute of hygiene. therefore the institute of hygiene overtook the released buildings of dorotheenstrasse. this complex of buildings was designed by emile dubois-reymond and constructed by spieker beetween 1874 and 1877, which is one of the most remarkable examples of the berlin 'Gründerzeit' architecture, especially the library and the lecture hall, where robert koch held his pioneering lecture on the origin of tuberculosis on march 24th 1882. in honor of that achievment he later, in 1905, he received the nobel prize of medicine. still today, on march 24th the world tuberkulosis day is observed.